Colorectal cancer (CRC) is the most common type of GI cancer in Europe with 68 CRC cases per 100,000 population. The disease has a much higher rate in men: 79 CRC case per 100,000 than women: 54 CRC cases per 100,000. 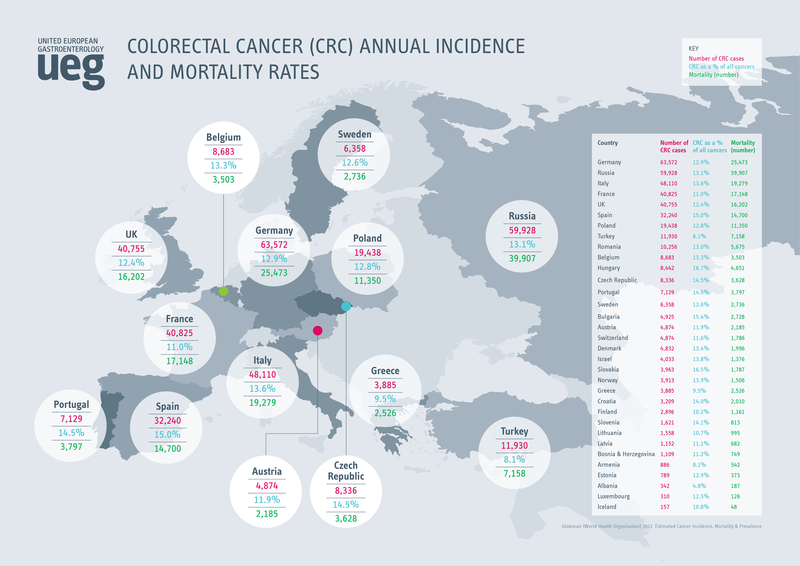 CRC accounted for 342,137 diagnoses and 14.3% of all cancer diagnoses in Europe in 2012. View further information on CRC below. 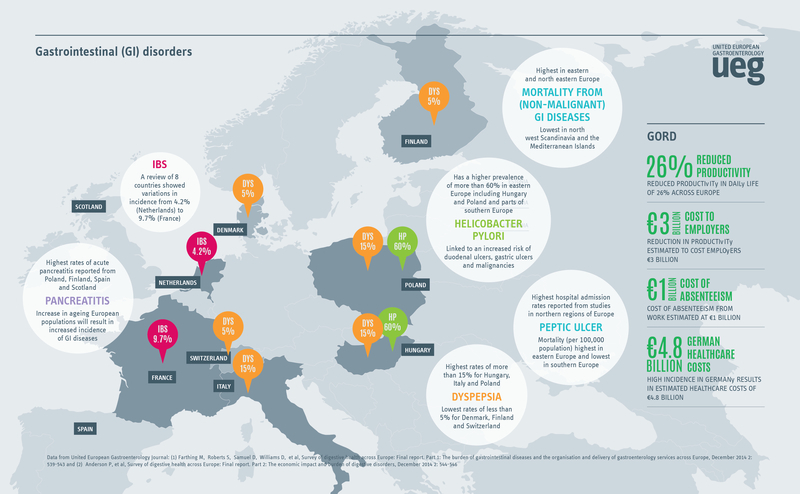 All information is taken from the UEG Survey of Digestive Health Across Europe, unless otherwise stated. 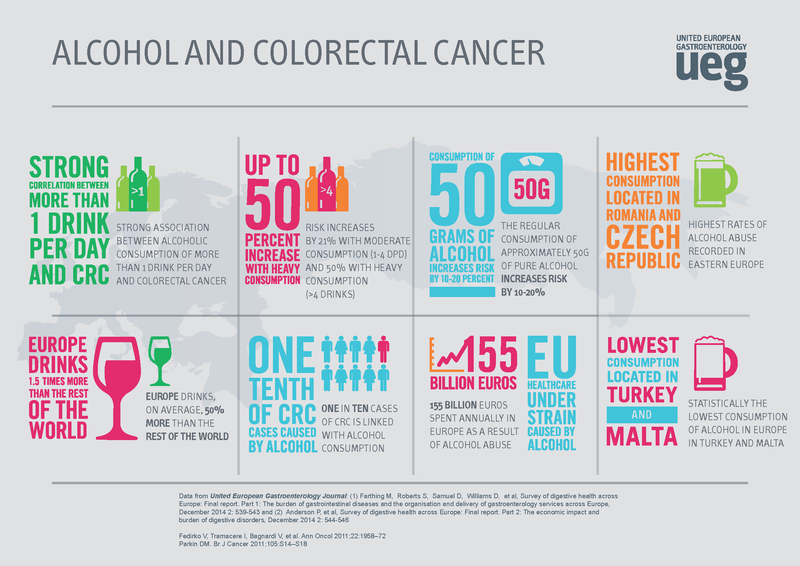 Canvassing the opinions of leading European digestive cancer specialists, stakeholder organisations and patient groups, the report highlights the scale of alcohol consumption across Europe and its direct and indirect impact on digestive cancers, including colorectal cancer. 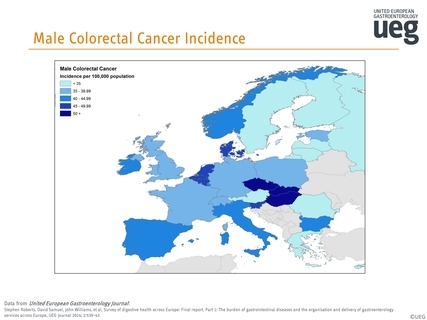 Colorectal cancer (CRC) is the second most common cause of cancer-related death in Europe. There is strong evidence to demonstrate that screening for CRC reduces incidence and mortality rates, yet there are vast inequalities in CRC screening throughout the continent. 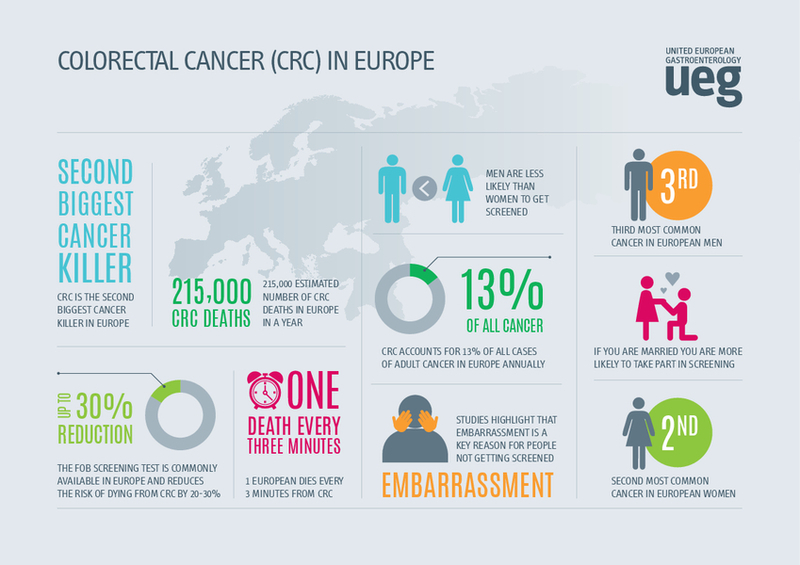 Find out more information on CRC screening across Europe in this informative leaflet. Presented by Eric Van Cutsem, UEG expert and Professor of Gastroenterology/Digestive Oncology at the Leuven Cancer Institute, UEG’s Diet, Lifestyle and GI Cancer video outlines key data on GI cancer and important risk factors. Developed in partnership with EuropaColon. 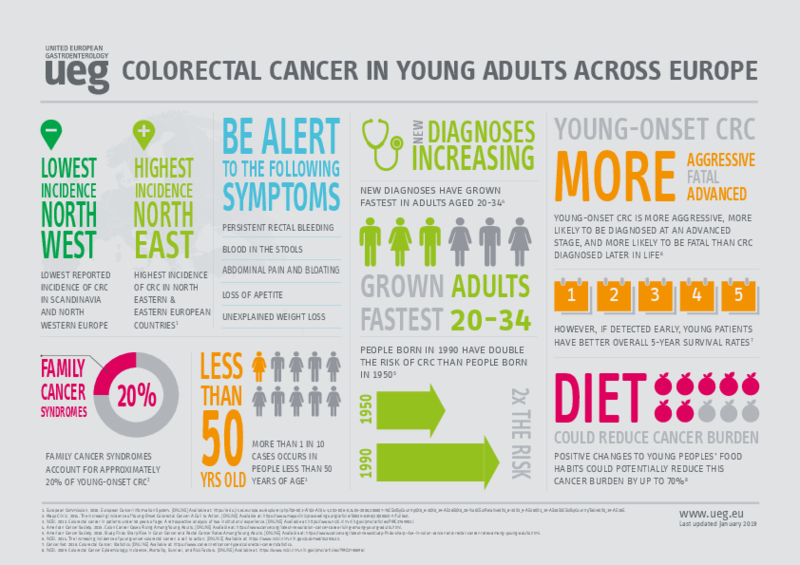 A leaflet for patients explaining the key facts about prevention and screening of CRC. 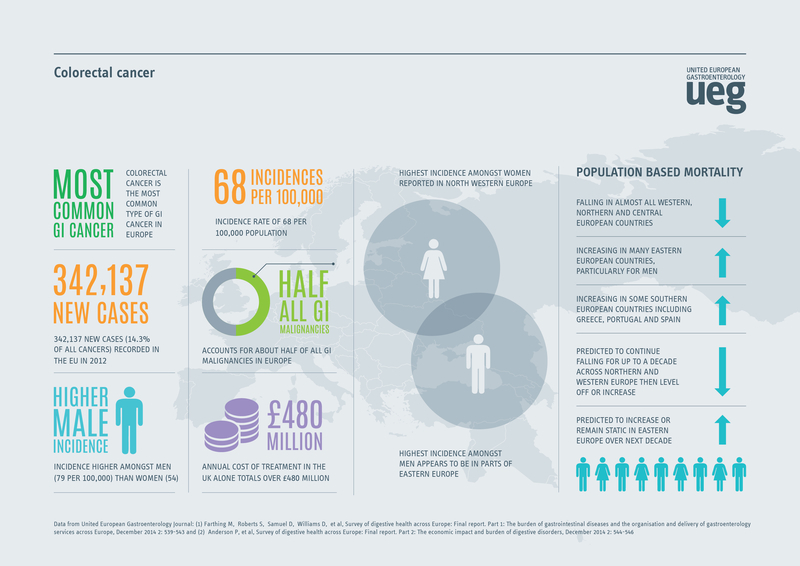 EuropaColon is the voice of the European colorectal cancer community. Its aim is to save lives by bringing together all key stakeholders in the fight against this deadly disease which is highly treatable if diagnosed early. 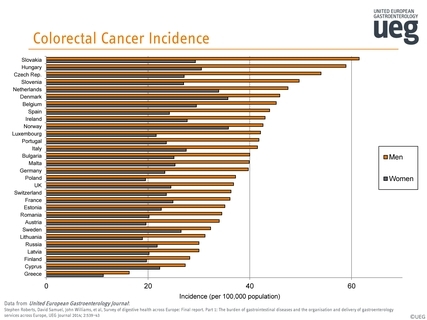 The mission of the association "Stop Darmkanker" is clear: we want to convince everyone that through early detection of polyps and colon cancer, death rates from colorectal cancer will drop drastically. Through various channels, the internet and social media, it organizes activities to provide information and education about cancer. The knowledge about this silent killer amongst the general public is still inadequate. CPC works to ensure that all European cancer patients have timely and affordable access to the best treatment and care available, throughout their life. 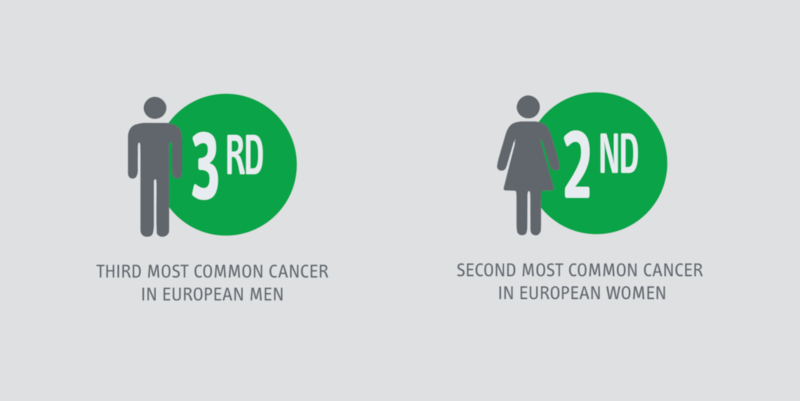 Policy makers, researchers, doctors and industry should recognise European cancer patients as the most important partners in the fight against cancer and against all the cancer-related issues affecting our society. ECL is a pan-European umbrella organisation of national and regional cancer leagues. 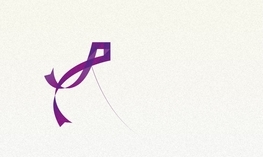 Since 1980, we have been providing a unique and important platform for cancer societies. From Iceland to Turkey, ECL is represented by leagues in the extended Europe. Together, we are "making a Difference in Cancer Prevention and Control!" 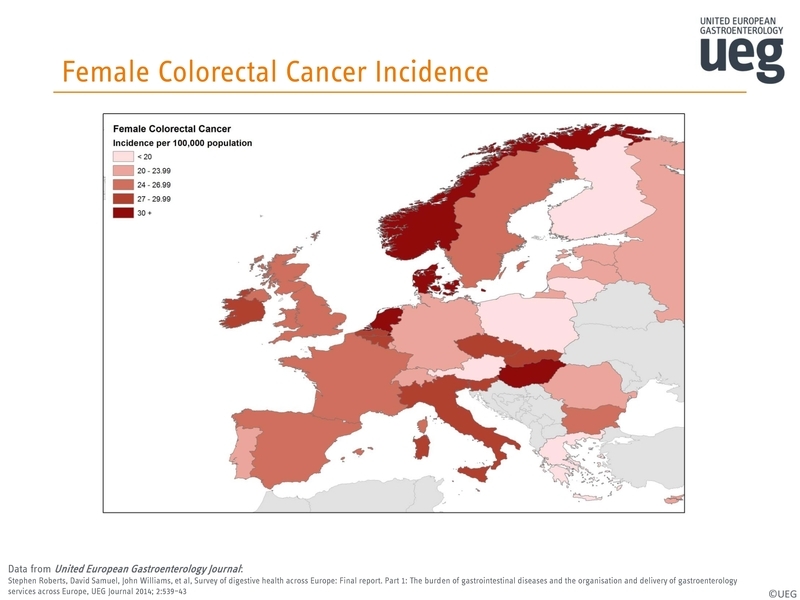 Information in this section has been checked and where necessary updated by UEG CRC experts Monique van Leerdam and Evelien Dekker. Last checked September 2016. Useful information, statistics and resources for patient organisations.